Most parents know that toddlers don't just suddenly put down the formula bottle, pick up a fork and start chowing down. Solid food needs to gradually be introduced into a baby's diet. While this introduction can begin at six months, there are some foods that parents need to hold off feeding a toddler until an appropriate time. By the time your toddler is one, she or he will most likely be eating some solids, although she or he is probably very picky. After their first birthday, you can start introducing some new foods that might entice that picky palate. After the 12-month mark, toddlers can start drinking cow's milk. However, it should be whole milk, as young toddlers need the fat. You can also begin introducing citrus fruits like grapefruit to your little one. Other types of fruit that might appeal to your child include melon (cut up, of course) and apricots, both great for eating with little hands. Little broccoli and cauliflower trees are also fun finger foods. While egg yolks are okay for babies to consume after six months, you should wait until your baby is at least a year old before you feed them egg whites. This is because of the probability of allergies caused by egg whites. The same goes for fish, shellfish and chocolate. Although honey can add a nice natural sweetness to many foods and drinks, your toddler shouldn't have any of it until she or he is at least one year old. Honey, along with corn and sugar syrups, need to be avoided because of the likelihood of causing an illness in your child. Once your toddler is a year and a half, she or he should be able to use a spoon and a fork. This means that they can be more involved in a family meal now. However, their attention span won't be improved very much and they will probably want to leave the table pretty quickly. 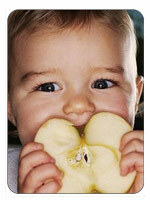 Your toddler's molars have also started to grow, which will come in handy for chewing. Despite this new easiness in eating, it's unlikely that your little one will want to eat very much at one sitting. Grazing may be more suitable than eating a full meal, which is perfectly normal. Regardless of whether your child is a grazer or full meal eater, encourage them to explore food on their own by offering them a variety of foods. Now is a great time to introduce them to dips and spreads. Not only can these be nutritious, but they can also make eating more fun and exciting. Look to serve items like guacamole, hummus, cheese and yogurt dips. Hummus can also work well as a spread on crackers. Another fun food that kids can get their hands onto at this age is corn-on-the-cob. Half a cob should be sufficient and your toddler will never know that food this fun is actually healthy. Now that your toddler is a bit older, eating meals with the family at the table should be a bit easier. They should be able to eat most of what the rest of the family eats, though still in much smaller portions. Also, sitting at the table for longer periods of time shouldn't be as difficult now. After your toddler's second birthday, it is okay to switch from whole milk to a lower-fat version. While your little one still needs the calcium from the milk, she or he no longer needs the high fat levels found in whole milk. By the third birthday, it should also be okay to introduce peanuts and peanut butter. Although it is possible to bring in this item after your child's first birthday, it is usually recommended to wait until now with peanuts because of allergies. However, this does not mean that you will avoid an allergic reaction altogether by waiting. But by three years, children's immune systems are more developed, therefore there is a chance that your child may have out-grown an allergy.